COOL RUNNINGS can accommodate 6 guests in 3 cabins. The Master cabin has a queen size bed, shower and toilet. 2 Guest cabins have a queen size bed, shower and electric heads. COOL RUNNINGS has air conditioning throughout. Crew has a separate heads and shower. Cool Runnings features a 7Kw generator and just added AC in both the guest forward cabins for those who prefer it to fans, also new 12 inch 110 fans have been added to the guest cabins. Also just added new Electric Heads. 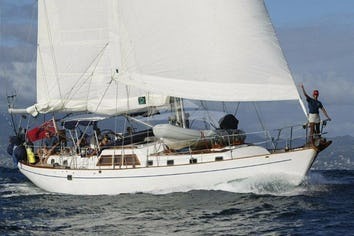 Cool Runnings ccarries 250 US gallons of fresh water and has a watermaker on board. Geoff and Bambi are back in the very beautiful Virgin Islands! After many many exciting adventures, (read more below), they have returned to the charter industry. ALEXIS 3, a 46 foot Robertson and Caine catamaran stole their hearts and before they knew it they were the proud new owners. This couple have had extensive experience, more than 12 years of sailing the oceans of the world covering in excess of 70 000 miles, in both mono hull and catamaran. From November 2003 to November 2008 they chartered their catamaran Alexis, hosting 70, one week charters, they got to know guests from all corners of the world, introducing them to the beauty and tranquility of this outstanding sailing ground. In 1998 Geoff and Bambi first crossed the Atlantic in Alexis their 33 foot Dudley Dix steel sloop. They cruised sublimely, visiting St. Helena, Brazil and her many exotic ports including the Amazon. After a quick stop in French Guyana they sailed the magic pathway of the Caribbean island chain, up through the pristine British and American Virgin islands, then on to the beautiful Bahamas and finally a turbulent trip across the Gulf Stream to land on the East coast of America. While cruising this incredible route, they encountered many many other vessels, many shapes and many sizes, one particular design seduced them completely, THE CATAMARAN, these specimens sailed flat! The 'Cat' attacked their imagination and they were entranced by the swift seemingly effortless gliding, spacious, upright sailing vessels. This seduction led to envy, watching the occupants draped in various attitudes of relaxation all over the decks in 15 knots of wind with glittering glasses of gin and tonic resting resplendent on the cockpit table, while they themselves were braced to windward, hanging on for dear life, dying of thirst and exhaustion! Before they knew it, the madness took hold and they had sold Alexis 1 (for the record, there were many tears at parting) flown back to Cape Town, South Africa and taken delivery of the hull, deck and bulkheads of an Admiral 38 foot Catamaran which was to be Alexis 2. Ten months of slogging, with Geoff, the help of an electrician and a carpenter saw the boat finished and exquisite. The exhausted pair found their new Cat a thirsty beast that had lapped up what remained of their cruising kitty! (Forgive the pun) In no time at all their dream of a slow circumnavigation was receding as fast as the bank balance! The thought of drifting through the crystal waters of the Virgin Islands kept haunting them, along with this visitation came the answer to their problems. They would cross the Atlantic once again and go chartering! This time they chose to stop in Jamaica, Cuba and revisit the friends they made in America, sailing right up the east coast to Chesapeake Bay for a whole summer of fun before making passage for the British Virgin Islands and the challenge of chartering guests began. n their previous lives Geoff owned a Building company, and Bambi a partnership in a Catering company, food had always played an enormous roll in the well being of charter guests and her expertise in this field did not fail them. This sojourn lasted five years, made up of 70, seven day charters, this was a period of growth, learning, making new friends and fun, until finally the cruising kitty was once again strong enough to take on the Pacific. They headed down the Caribbean Sea to Trinidad where they could ready the boat for the major ocean passage. A wonderful stop in Cartagena, Columbia for Christmas and then down to the awesome Panama Canal, unforgettable memories were made never to be forgotten. The Pacific proved to be enormous, the distances between the islands long and sometimes arduous, the weather patterns isolated and difficult to predict, storms and rain squalls would pop up out of nowhere to shake them out of lethargy, the longest leg being 20 days between the Galapagos Islands and the French Marquises. This is where the criticism ends, the rest was a dream, the islands exotic, stunning in their almost untouched beauty, above and below the ocean was all as god made it, beautiful! With all their dreams fulfilled, the plan was to sail on to Australia and to sell Alexis 2 and then to fly to New Zealand for a bit of a 'walk about' and finally back to Cape Town to 'settle down', after all, they had been sailing for 12 years, surely that was enough? One year later - they were once again excitedly relating news of their purchase of a 45 foot Robertson and Caine called Cool Runnings! It's back to the water, back to life aboard, and back to chartering in the British Virgin Islands!! From April, 2015, until the summer of 2018, Geoff and Bambi were happy aboard Cool Runnings. Hurricane Irma flipped that happiness upside-down - literally. Cool Runnings was totalled out by her insurers. 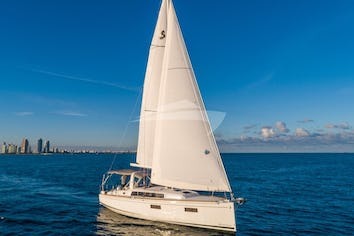 The happy news is, Geoff and Bambi immediately acquired a newer model Leopard 46 catamaran, and returned to their original naming scheme, thus ALEXIS 3! Listed below is a selection of Chef Bambi’s cuisine. There is a Preferance Questionaire below for guests to complete, this enables us to prepare dishes to satisfy your individual tastes. Breakfast is always served with freshly brewed coffee, tea, fruit juice, toast, breads and preserves. * French toast wedges served with breakfast sausage and or maple syrup. Below is a small selection of delicious dishes, we constantly add to and change the menu following the availability of the best seasonal ingredients. All served with bottled water, soft drinks, beer and wine and fresh baked crispy breads. * Classic fresh tuna salad with green beans, baby potatoes, mimosa and calamata olives served with yogurt mustard dressing. * Caribbean chicken salad. Served in iceberg lettuce cups. Grilled chicken, mango, red onion, cucumber, sultanas, lightly tossed in a creamy Caribbean curry dressing. * Gaspacho. This spicey Spanish classic cold soup is served with chopped olives and sour cream garnish. A cheese board, crackers and homebaked wholewheat breads. * Pan fried Flounder with capers, served with white bean, sweet peppers and feta salad. * Smoked Mackerel or Shrimp salad. Romaine lettuce, baby tomatoes, green onions, cucumber batons and avocado with Cool Runnings own vinegarette dressing. *Tortillas. Build your own scrumptious tortilla, a selection of fillings including chicken, beef, tomato salsa, cheese, lettuce, jalapeno’s and sour cream. *Wild mushroom and bacon linguine pasta served with green salad or Bambi’s own take on Chow Mein. * Tuna tataki with asian seaweed salad and ginger dressing. * West Indies watermelon and goats cheese salad with citrus dressing. * Caramalized onion, grape and blue chees in feather light puff pastry. * Cape malay samoosas served with fruit chutney. * Smoked salmon and dill roulades with caviar garnish. * Mexican and black bean soup served with sour cream garnish. * Coconut lime and chilli barbecued shrimp. Island savoury rice and snap peas. * Mahi Mahi with shrimp cake, grilled and served on sauteed bok choy with sesame, garlic, ginger and soy dressing served with basmati and stir fried red peppers. * Deboned Cornish hens roasted with plums in red wine served with creamy mash potatoes and seasonal vegetables. * B B Q Evening : Great steaks or ribs served with mushroom sauce, baked potatoes and ratatoulli. * Thai shrimp and linefish green curry served with jasmine rice, thai vegetable fry and popadums. * Pork Tenderloin roasted in mustard and honey sauce served with garlic potato bake, brocolli and almonds. * Pan fried duck breasts with cranberry and caramalized onion, sauteed potatoes, asparagus. * Pear and almond tart served with Amaretto ice cream. * Ricotta Cappuccino with crushed Biscotti. * Fresh blackberry nepoleons with cream chees mousse. * Amarula and Chocolate Fondue Fantasy. A week of frolicking and fun on catamaran COOL RUNNINGS, as guests "themed" their way through the Vigin Islands the last week of May, 2017, with the Aloha Spirit and Gilligan's Island both aboard, and finally a Darker Shade of Black. Theo and Gussie, we want to thank you for the wonderful gift you gave to the six of us, the gift of showing us the places and the creatures that you know so well. The special touches, the "fairy" showing up in places we did'nt expect, like our beds being made and our cabins kept so beautifully clean each day! You spoiled us and we are all so grateful. We treasured the moments we had with each other and also the times we spent with the two of you. we had such fun we did things we never would have imagined doing. The culinary, sailing knowledge you shared , we will never be the same we will never forget. May you know in your hearts that you have been a wonderful blessing to each of us. We look forward to staying in touch! Blessings to you both,Mark, Kim, Julie, Randy, John and Lori Ann. We have barboat chartered before and were very apprehensive about being on a crewed boat. How unfounded out fears!! What a joy it was to sail with Theo and Augusta, they planned and executed a trip we all loved, with Pizzazzz! The variety of locations were ideal the food delicious, plus the catamaran was spotlessly clean and comfortable. We felt so well catered for, we started to call our hosts "Mom" and "Dad"! Sorry we missed you Bambi and Geoff, having said this your crew could not have done any better! We had a really spectacular week on Cool Runnings. Gussie and Theo made a huge effort and really made our time aboard extra special. The boat is in great shape, they showed us awesome anchorages and beaches on he islands. The meals, drinks and attention to detail great! They were really patient with the kids our time was personal and nothing too much effort for them. A great couple a great holiday! Mike, Jessie, Joe, Dan, Robbie and Hayley. Theo and Gussie, thanks for welcoming us to the amazing life of sailing! This week was our first time and you made us feel right at home at sea.We stayed in an hotel before boarding Cool Runnings this was WAY more comfortable, exciting and fun!We are already working on when we will be back.Until next year! Mark, Conna, Elena, Janice Downing. An amazing holiday we had with you this week! From Theo's hello to Gussie's welcome aboard we felt comfortable and happy aboard Cool Runnings.The food was absolutely wonderful, John is going to wonder where his American Breakfast is every morning!Island hopping, sailing, snorkeling and rock jumping at the Baths, ( still can't believe we did that) and sunrises Alison's best time of day! All this truely made our vacation an experience of a lifetime.As we leave the boat today we will hear Gussie say once again " goodbye children" only this time it will a while before we see you again. We hope to be back aboard Cool Runnings soon so we can get " tummy stiff" again! Thank you our new friends. What an amazing week sailing through the BVI 's we had with you and our friends Wendy and Doug. During the week you not only were the best host/hostess but truly became good friends.We enjoyed hearing about your travels and your insight about the islands was amazing.Gussie your cooking was first class and we will miss the "crunchies." We will definitely stay in touch and hope to bring our kids along next time. Thank you again for EVERYTHING! Adam, Stacey, Doug and Wendy. Making us smile and laugh. Taking care of our every need. See you soon we want to do this all over again!!! We have had a really wonderful sailing trip aboard Cool Runnings. Geoff was a fabulous Captain always looked out for us and our safety. Both Geoff and Bambi were very warm welcoming and friendly. Bambi on a scale of 1 to 10 - was a 15 !! Every dish was gourmet. The boat is in excellent condition always spotless. We enjoyed every minute! Thank you for a wonderful trip to remember always! Tom, Coleen, Doug , Deborah, Tim and Jean. Our family of four including two active boys ages 12 and 10 stayed with Geoff and Bambi aboard Cool Runnings for a wonderful family Valentine charter which included visits to the bays and harbors of St. John, Tortola, Norman Island, Jost Van Dyke and St. Thomas. This was the trip of a lifetime; a totally different experience for us "non-sailors" and it was truly amazing, all around. Geoff and Bambi are a great team who make staying with them completely comfortable in every way. Bambi is a gracious and warm hostess with incredible culinary skills. Seriously, the food and presentation were fantastic. She made delicious meals with all the foods we love. : ) Geoff is great both at the grill (yummy steaks!) and a fun captain who clearly is happiest when he's at the helm. Watch how he lights up when the sails unfurl. When we'd moor or anchor for the afternoon, our boys had a blast jumping off the boat, swimming under it, tubing, kayaking and SUP paddle boarding. Geoff and Bambi took us to all the great snorkeling spots where we saw unbelievable coral reefs teeming with a variety of sea life. I loved looking them up afterward in Bambi's reference books. All in all, this was an unforgettable adventure for all four of us and we'd do it again with Geoff and Bambi in a heartbeat. Thanks so much! We have had an amazing journey from beginning to end! Appreciate you opening your " home at sea" to us Georgians. We have not wanted for any little thing. The cooking has been fabulous! We checking into fat camp when we get back home. (that if course is minus TD). We hope to come back soon! Big thanks for making sure we were able to watch "the Game". Alabama all the way!! Susan, Travis, Trip and Tracy (TD), Georgia. I think we summed it up this morning when we told you, " we wanna be you when we grow up or even in our next life!!" Thanks for sharing so completely your New Year week with us. We truly enjoyed getting to know you, and appreciate your patience in dealing with teenagers. You have inspired us to add more adventure to our lives. Kip hopes to try all your recipes in his own kitchen! Thanks for a week we will always cherish this memory. Laid back and relaxing to the extreme, your patience with the kids was great and even greater to get to know you two and share briefly in your wonderful world. As grandparents of two picky kids, we enjoyed your enthusiam and all the fun and good food you provided. You and Cool Runnings are definitely in our future plans! A perfect trip to the BVI's is spending 10 days with you aboard Cool Runnings! We were pampered beyond our wildest dreams and showered with attention each and every minute. The royal service, the laughter, the incredible food, while touring "the Islands" were all amazing and we would like to cruise with your forever!! Yet, we must go home, we leave with wonderful memories and two new friends. Thanks so much for taking such awesome care of us. This was THE most relaxing, wonderful family vacation! Since I am cook I am especially appreciative and blessed by both your attentive catering and scrumptious meals!! We cannot say enough great things, we have loved it all. Cynthea, Martin, Woody, Karen,Vern and Linda. On board, 11 doctors and one lonely business man, all friends, for this week we were equipt for medical emmercencies would you say !! To the ultimate host and hostess, We have had 5 wonderful days of fun and relaxation very much due to your endless hospitality. Each meal was created to perfection and exceeded our expectations! Cool Runnings and all of its ammenities kept us super comfortable and entertained. The excellent Rum Punches and Painkillers helped as well!!! It was truely a pleasure to meet you both and we wish you happy sailings and hope our paths will cross again soon. Thank you, thank you, thank you for the BEST HOLIDAY we could ever have imagined! Word fail, this trip was beyond all expectations. Curt and I loved sailing and sitting on the "trampoline", always afraid for missing out on your entertaining stories. Bambi the cooking was amazing, works of art that tasted even better than they looked. Love your sweetness but also love the candor! Geoff Great sailor with hilarious stories! Love the sense of humour! Thanks for an anniversary to remember! It is difficult to follow Ali's glowing thanks for a fab vacation, but I'll give it a go.... It takes two very special people to allow perfect strangers from totally different walks of like to come into your "home" and treat us like family. You did everything right and insured that we all had the vacation of a lifetime!! Thank you so much for taking a "High Maintenance" flat-lander from the Prairies of Saskatchewan and giving us sea legs!! Of course the food was incredible, the drinks were superior and your experience and wisdom was most enjoyable. You truly feel like family and we have already started planning our next visit to Cool Runnings! How do I start to say thank you? Yes our trip number # 5 and this was the best of all of them, the cabins were nice, dining area was beautiful, and we loved the mats and pillows on the trampoline it seemed an extension of Geoff and Bambi. Bambi kept the cabins spotless! The rest of the boat was kept very clean as well. We fell in love with Geoff and Bambi! They became like family friends to us....absolutely lovely! This crews service is and was "Excellent! " Can't say enough good about them. We felt very pampered all week! Perfect mix of professional and friendly. Geoff taught our boys how to sail, which they loved! We got history lessons, great recommendations for activities, and excellent service throughout our week. You were 100% correct Andrew these two are magnificent with children. Bambi's meals were a dream! She is unbelievable. Every single meal was exceptional. She truly is a master chef, and created incredible tastes every day, in such a tiny space. We couldn't say enough about the delicious breakfasts, lunches and dinners. As you know we had planned for 2 evenings ashore, but that ended up as zero meals ashore.............. here is more on her meals, just Beautiful! There's nothing quite like taking a morning snorkel and coming aboard to find a beautiful table set for you! We were astounded by the number of different table settings she kept on that tiny boat! Meals were a dream!! And the crunchies.....best snack ever! We've made them several times since we arrived home. Delish! We will sail with them no matter where they be. turtles was one of the BEST experiences ever! of course every meal we ate on board. Bambi you are a fab chef. and happy sailing thank you for everything! Once again, we thank you for your incredible hospitality aboard Cool Runnings Our 6th adventure with you could'nt have been more lovely. A few new stops, more creative and inventive top - notch cuisine, and the part we love most.... Your company and friendship. You mean the world to us and we look forward to future adventures with you and Cool Runnings .... wherever that may be! Scott and Jeff, Crystal and Amy. Thanks for a wonderful week! EVERYTHING was really perfect, specially the food!!! You are a great chef, we hope to come back soon. We have two new friends! Was an amazing honeymoon trip, you are very nice and wonderful people. Thank you very much, I hope to see you soon in another great experience. advice, they know what they are doing. There is so much to see and do. 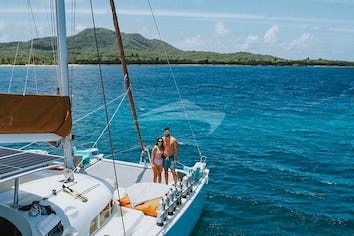 husband and my second time in the BVI's, sailing on a catamaran yacht. friends, is a week in paradise. I hope you enjoy yours! with you. We thank you for making our week so awesome. We hope to bring the family for a sail! Cool Runnings and her crew, Bambi and Geoff, are the best!! always giving us various alternatives from which to pick each day. Anne, Ben, Weldon and Ben J.
Dear Bambi and Capt Geoff,Wow !! Thank you thank you! You have made us feel special...... the food..... the presentation..... EVERYTHING! Never felt so comfortable on the water before, you guys were great! You made us believers to spend our Caribbean vacations on the water, this was a first! Everything was perfect and can't wait to return to enjoy amazing cooking and hospitality! Cap'n Geoff and Bambi --- First, thank you for agreeing to do a "short" cruise with us none of us had done this before so it was great to "get our feet wet." I new I had hit a home run when Marlene said : "I don't know why we are messing with the house on St. John!" Thank you for everything... really.... you two are the BEST!